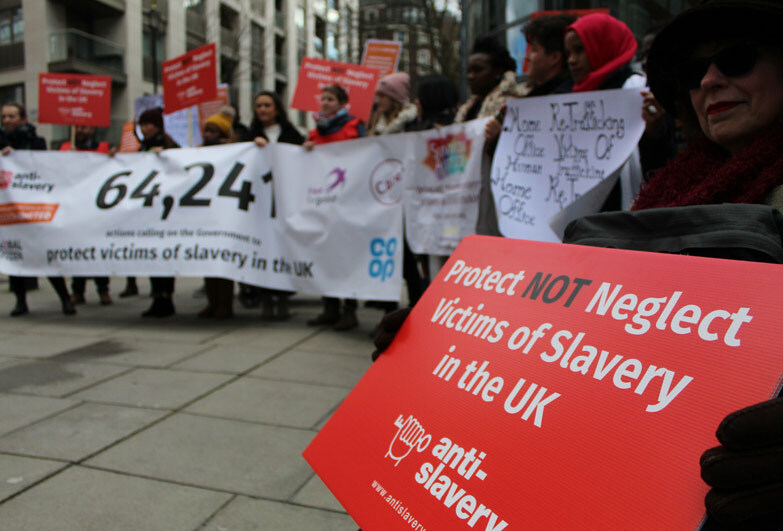 11,519 of you signed our petition to protect, not neglect, the victims of slavery in the UK. 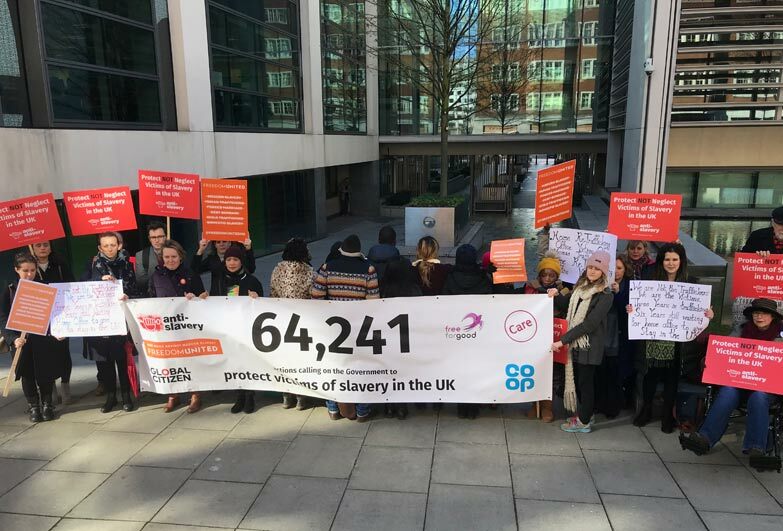 This contributed to the total of 64,241 collective actions taken by supporters of all coalition partner organisations we have campaigned with, including petitioning the Prime Minister and the Home Secretary, as well as emailing and tweeting to MPs to back the Victim Support Bill that would guarantee good support to all victims of slavery in the UK. We took your voices the the government – here is how the day went. 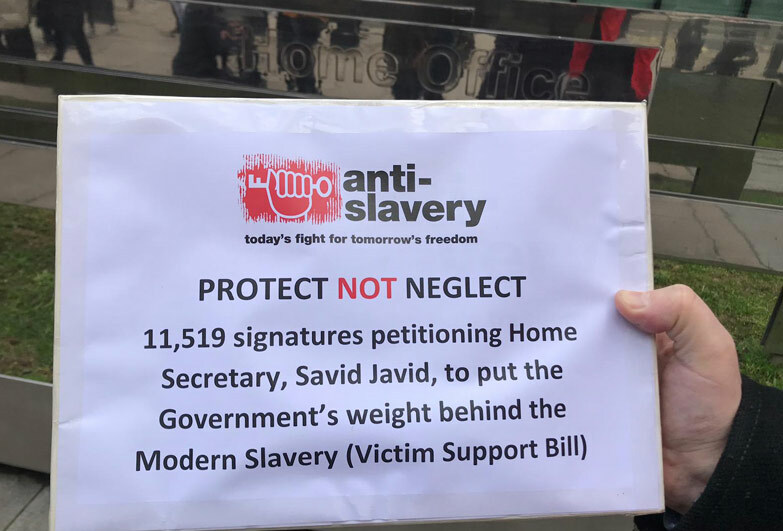 On the 14th March, we gathered outside the Home Office with 11,519 signatures by Anti-Slavery supporters asking the Home Secretary Sajid Javid to back the Victim Support Bill. Thank you to every person that signed this petition! We were joined by a number of wonderful Anti-Slavery International supporters. We were also joined by survivors of slavery. 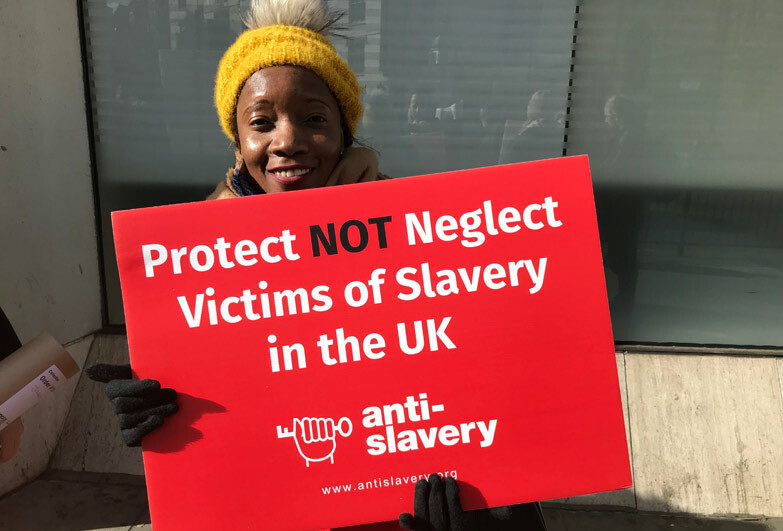 One of whom came in to the Home Office with us to deliver the petition, explaining why this Bill is crucial for victims of slavery – it was a very powerful moment. 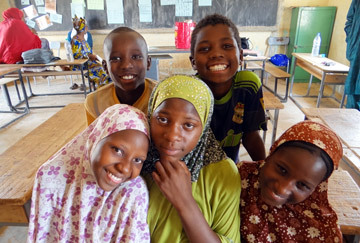 The survivors are pictured here with their backs turned to the camera, as they feel that if they show their faces not only it may put them at risk from their traffickers, but it also may affect the support they receive. 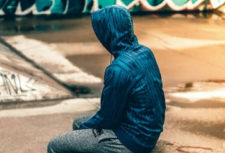 We need the Victim Support Bill passed so that they can finally show their faces and walk the streets like the rest of us. We are victims, not criminals, was one of the main messages brought by survivors. It in unacceptable that we make the victims feel this way. 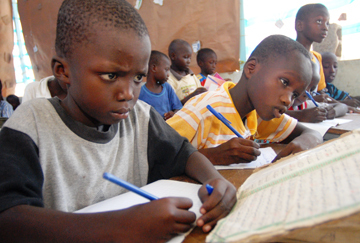 Instead, we must give them all the support they need to recover from the ordeals. 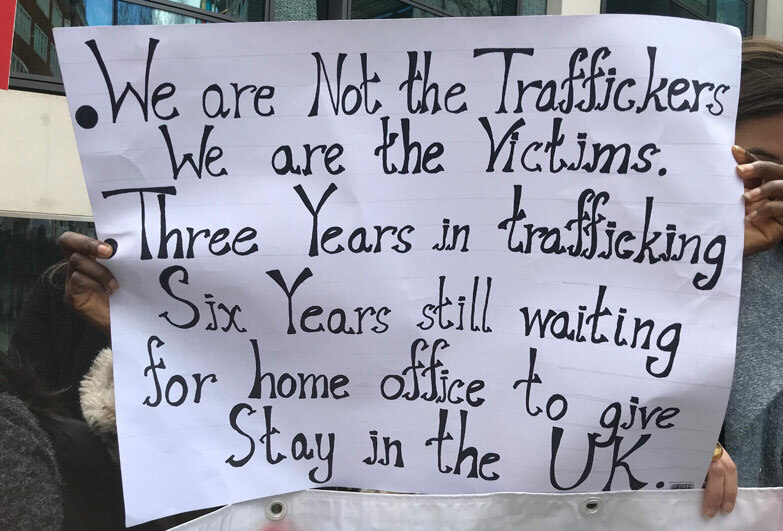 From the Home Office, we marched through central London to take our petition to 10 Downing Street. 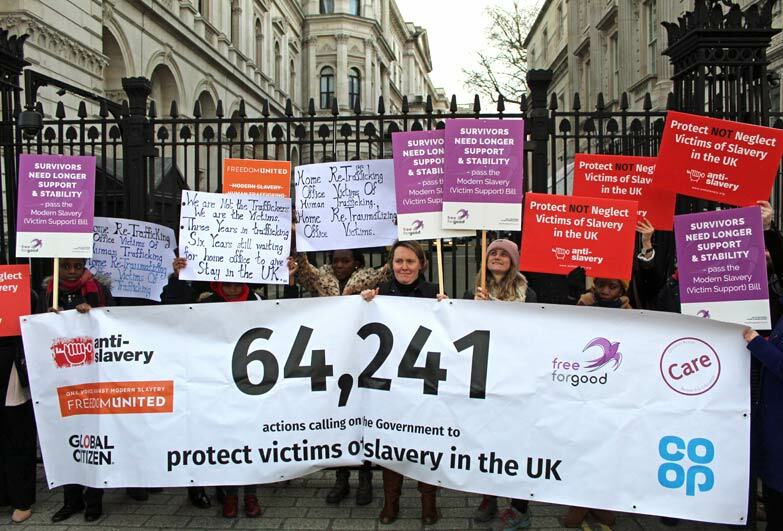 Here we are outside Downing Street with the other organisations that supported this petition; Freedom United, Global Citizen, Free for Good, Care, the Co-op and the Survivor Alliance. 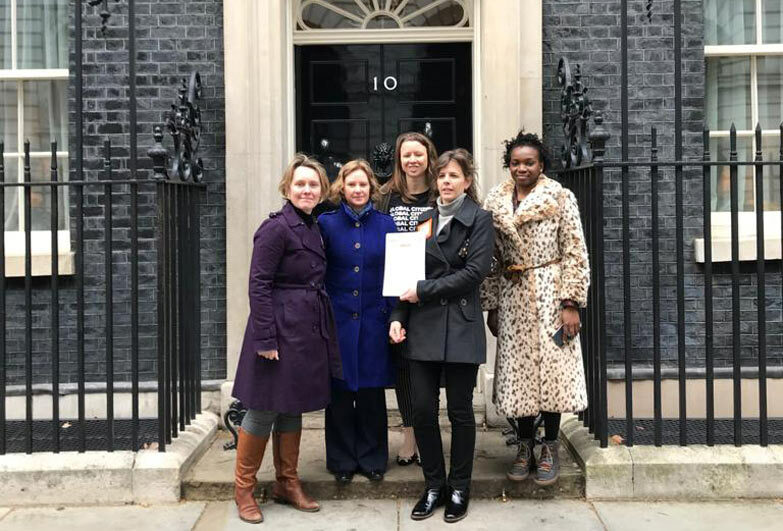 Handing in the petition to Number 10 Downing Street. 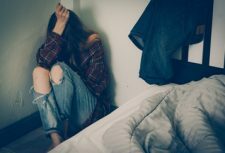 This petition gathered over 26,000 voices of our partner Freedom United suporters asking directly the Prime Minister to back the Victim Support Bill. 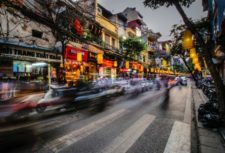 We hope the Government changes its current stance and fulfils the promises of leading the way in fighting modern slavery. Our message is simple. 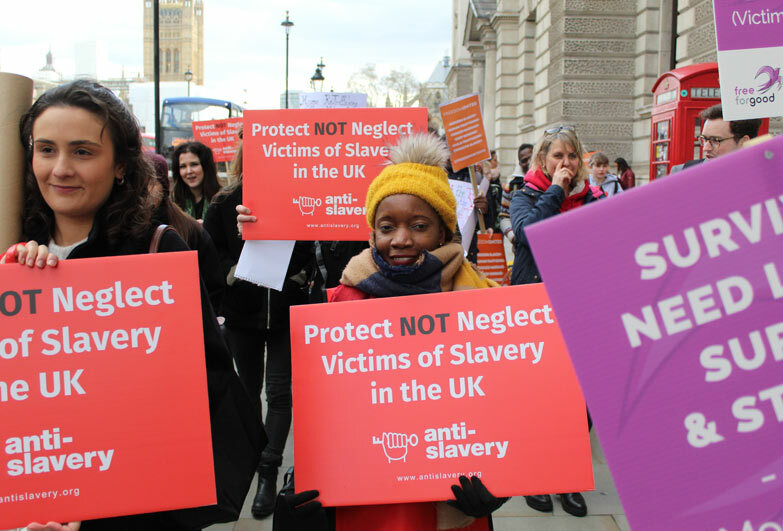 Protect not neglect victims of slavery in the UK.